We at MAS Business recognise one factor as being pivotal, and that is the importance to any organisation, regardless of its size, of the need to be accountable to its stakeholders, to the extent that this refers to material issues concerning them in the field of sustainability. -The term "accountable" is widely recognised in the sphere of performance in sustainability. 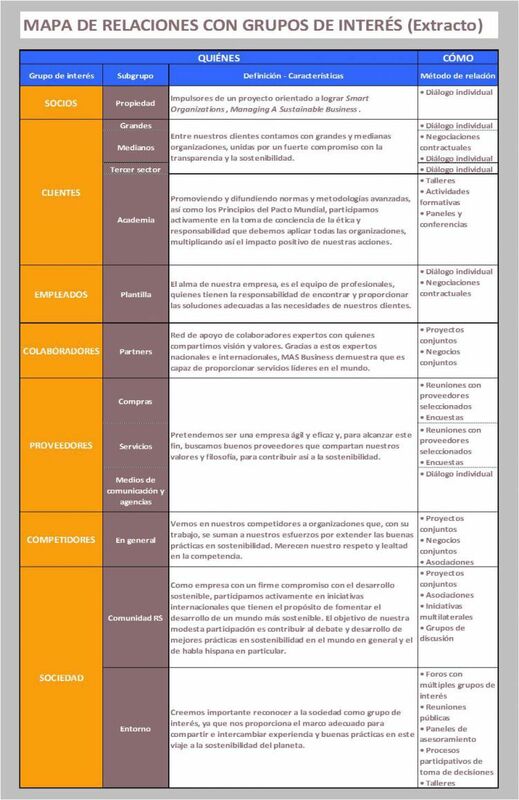 Although there are some translations, such as "rendición de cuentas" or "responsabilidad", neither of these entirely captures the spirit of the original term, which is a combination of both, so as to be more transparent and strengthen stakeholder engagement. For the review of compliance with the Foundation Principle of Inclusivity, we used the methodology proposed in the AA1000SES Stakeholder Engagement Standard (2011): the pertinent stakeholders must be identified for the purpose and scope of engagement. A methodology to identify stakeholders must be established. Influence - groups and individuals who can have impact on the organisation&apos;s or a stakeholder&apos;s strategic or operational decision-making. We identified eight stakeholders, seven of whom are crucial to the success of the business and with whom we maintain a very direct and interactive relationship. The eighth stakeholder is society in general and, though our power of influence and interaction is minimal, we consider that, by fostering the development and dissemination of good practices in CSR, we are contributing to a more sustainable, fairer and better world for all. The methodology proposed in the above AA1000SES Standard lays down that stakeholders must be profiled and mapped, and a methodology for such profiling and mapping must be established. This profiling and mapping is to be taken into consideration in the planning and implementation of the engagement. the geographical scale of the operation. The methodology proposed in the AA1000SES Standard lays down that the owners of the engagement must determine the level(s) and method(s) for engaging with stakeholders that are best suited to the purpose and scope of engagement and to the relevant stakeholders. the respective interlocutors at the individual stakeholders. As defined by the AA1000APS Standard, a material issue is an issue that will influence the decisions, actions and performance of an organisation or its stakeholders. For the review of our degree of compliance with respect to the application of the principle of materiality, we used the three-stage methodology proposed in the document, "The Materiality Report (2006) - AccountAbility". -Stage 1: Identifying pertinent issues of a wide spectrum of sources and stakeholders. Business, reporting and risk-assessment strategy. Good practices observed in similar businesses. Good practices specified in internationally recognised standards, such as DJSI, FTSE, Global Compact Principles, SIGMA Project Model. Issues raised in public debates in society: Observatorio RSC, CSR Observatory, National Plan on CSR, 2014 Edelman Trust Barometer Spain, European Comission Eurobarometer. -Stage 2: Application of a set of filters consistent with ascertaining the level of importance of the issues. Application of the Principle of Materiality compliance criteria specified in the AA1000APS Standard. GRI research project: Sustainability topics for sectors. Research project: "Sustainability. What matters?". Governance & Accountability Institute, Inc. Reviews by a panel of external experts, representative of the stakeholders. Approval at the highest level of management. Using this, we drew up our list of material issues shown below. For classification of material issues by capital we used the methodology proposed by the SIGMA guidelines (2003) developed by the SIGMA Project. Social Capital: social structures and relationships. Our management of sustainable development. Like any responsible organisation, we see it as our obligation to work actively for sustainable development. To achieve this and ensure that it does not remain a mere declaration of good intentions, in accordance with the Principle of Responsiveness, we apply the methodology proposed in the SIGMA Guidelines (2003) developed by the SIGMA Project. Holistic management of five different types of capital that reflect an organisation&apos;s overall impact and wealth (in the broadest sense). The exercise of accountability, by being transparent and responsive to stakeholders and complying with relevant rules and standards. Social capital: social relationships and structures. Natural capital encompasses the other capitals, as natural resources and ecological systems form the basis of life on which all organisations (and wider society) depend. Social, human and manufactured capitals are critical components of an organisation and its activities. High levels of these capitals deliver value to both organisations and society, not to mention improving the quality of life of stakeholders. Financial capital is crucial to the ongoing survival of an organisation, and is simply derived from the value that the other four capitals provide. All of the capitals are heavily interlinked and there is some overlap between them. Our management of the anticorruption principle. As signatories of the United Nations (UN) Global Compact and members of its Spanish Network, we subscribe to, apply, promote and disseminate the Ten Principles of the UN Global Compact. Internal analysis. Both country risk and sector risk are rated as low. No contracts have been entered into with the Government authorities, so that any risk posed by this factor is likewise low. All payments are monitored and made by head office. Policy. All MAS Business staff, as well as any party that might at any time represent the organisation, are forbidden to make, offer to make or promise to make any payment (regardless of whether such a payment is really made) or deliver anything of value directly or indirectly to a third party, including any civil servant and/or professional, for the purpose of helping MAS Business obtain or retain an improper commercial advantage, regardless of whether or not any benefit is received in exchange. Actions. This policy is known to all employees and is communicated to third parties with whom a new relationship is to be established.